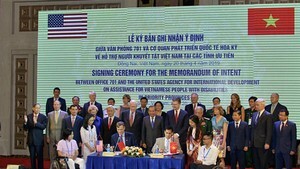 Sai Gon Giai Phong will spend VND1.7 billion (US$89,000) building 50 houses and providing 100 scholarships for poor families and ethic minority communities in the Central Highlands province of Gia Lai, SGGP editor in chief Tran The Tuyen said July 13. The houses and scholarships will be delivered to people in the three border districts of Chu Prong, Duc Co and Ia Grai. The houses will cost VND30 million each, and the scholarships will be worth VND2 million each. At a meeting with Gia Lai Province People’s Committee chairman Pham The Dung, Mr. Tuyen said the project was part of the newspaper’s “Nghia tinh Truong Son” (Sentimental Attachment for Truong Son Road) program. The program aims to commemorate the Truong Son Road, also known as the Ho Chi Minh Trail, a vast network of secret roads and paths built by Vietnamese revolutionaries to channel supplies from north to south during the wars for liberation against the French and Americans. The Joint Stock Commercial Bank for Foreign Trade of Vietnam will distribute the funds, he said. Provincial border guards and soldiers will begin construction of the houses on War Invalids and Martyrs Day, July 27. In addition, Mr. Tuyen and Mr. Dung have also agreed to organize a charity concert in the province called “Nghia tinh Truong Son” on the occasion of the 66th anniversary of the establishment of the Vietnam People’s Army, December 22. The gala will feature singers and artists from HCMC and Gia Lai. All proceeds will be used to build a temple to commemorative the heroes and martyrs who laid down their lives in the wars against the US invaders and French colonists in the province.